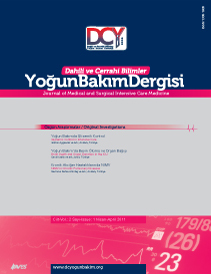 Aim: The aim of this study was to evaluate the effect of the time which elapsed from the clinical diagnosis of brain death (BD) until the confimation report on organ donation rates in a general intensive care unit of a training hospital in Izmir. Materials and Methods: The characteristics of cases diagnosed as brain death in the intensive care unit of a training hospital between 01.01.2007 and 31.12.2008 were evaluated retrospectively. Demographic and clinical features, the time which elapsed from the clinical diagnosis until confirmation report, rates of acceptance and decline, factors affecting these desicions and the characteristics of patients’ relatives were recorded. Cases whose relatives accepted and refused organ donation were compared according to these variables. Results: From the 1759 patients followed up in the ICU during the study period, 48 were diagnosed as brain death. Median age was 48 (33-62) years. The etiologies of BD diagnosis were medical causes in 29 cases and traumatic causes in 19 cases (13 due to traffic accidents). Twenty nine patients (60%) were referred to the ICU from the emergency room, 11 patients (23%) from another center and 8 (17%) from within our hospital. Forty-two patients (88%) needed inotropic or vasopressor agents. Acceptance rate of organ donation was 69% in 33 cases. The median time to confirmation reporting from clinical diagnosis was 6 (5-16) hours in patients whose relatives accepted donation and 22 (60-90) hours in those whose relatives refused donation (p=0.03). The median time from reporting to harvesting was 5 (3-7) hours. Median 4 (3-5) organs were harvested and used for transplantation. The effect of the organ transplant coordinator was predominant in 64% of relatives who agreed to donate. The main cause of refusal was religious factors in 87%. Conclusion: The awareness of intensive care workers of potential donors, maximum effort spent to shorten the time up to reporting after clinical diagnosis and requests to the family made by a trained and experienced organ transplant coordinator may increase the low donation rates in our country.